Double Vision After Cataract Surgery – What To Do? The proper medical name for double vision after cataract surgery is diplopia. Ironically, diplopia can also occur prior to the procedure being performed. This side effect might mean that a surgical revision has to be made at a future date, or it can simply be something that passes after a short period. 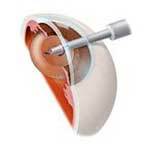 Cataract surgery itself is pretty safe for patients when they are in a good state of health. However, cataract surgery side effects usually occur when the person having the surgery performed on has an underlying medical condition. Complications can range from the mild and barely noticeable to issues as serious as heart attack or stroke.